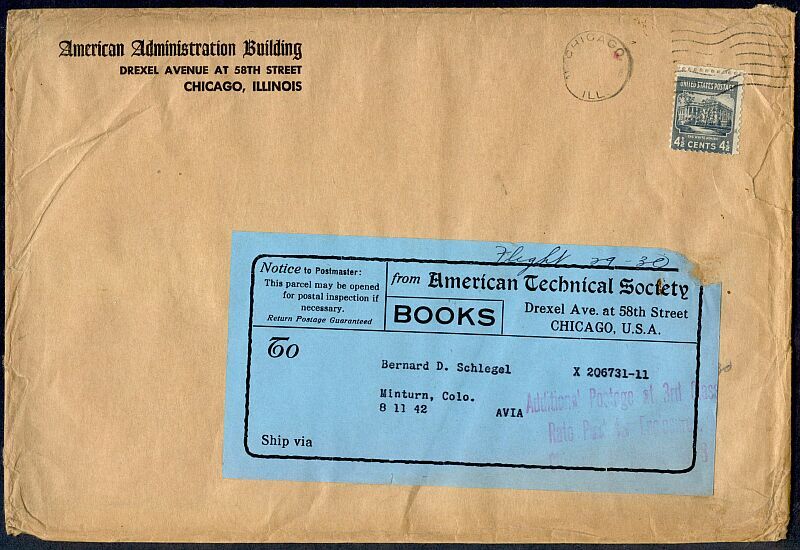 An unusual combination of third and fourth class usage involves the special fourth class rate for books with additional postage for third class enclosures. Two possibilities requiring four and one-half cents postage are possible. The first is one-and-one-half cents postage for one pound at the fourth class book rate (possible from November 1, 1938 until July 1, 1942) and double the two ounce third class rate. The second possibility is three cents for one pound at the fourth class book rate (July 1, 1942 until March 26, 1944) and one-and-one-half cents for a third class enclosure under two ounces. If the "8 11 42" on the label of this example indicates a date, this second possibility is the correct one. The handstamp indicating that extra postage was paid for a third-class enclosure is poorly struck on the lower right portion of the label.